Peter Drucker once said, “Culture eats strategy for breakfast”. 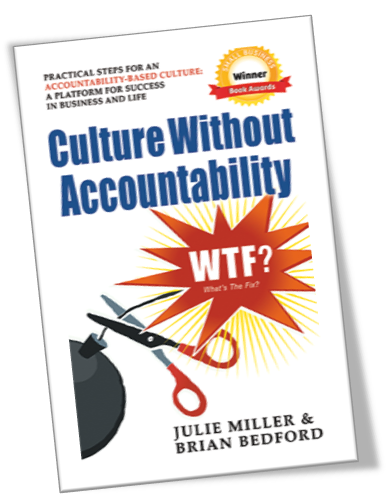 Tune in to The Unleashed Radio hour this Thursday from 10am-11am (CST) on Business 1110am KTEK (streaming live at www.business1110KTEK.com) where our guests, Julie Miller and Brian Bedford of MillerBedford Executive Solutions, discuss their book Culture Without Accountability: What’s The Fix?. Julie and Brian will also share their global experience, which allows them to quickly diagnose issues that are limiting an organization’s success, and to quickly recommend solutions for your business! This entry was posted in Accountability, Book Club, Coaching, Community, Entrepreneurs, Leadership, Organizational Culture, Success Tips, Talk Radio, Vision and tagged bestselling author, Book Club, Coaching, Community, Entrepreneurs, Interview, Leadership, Management, Organizational Culture, Success Tips, Vision. Bookmark the permalink.